Instagram has recently announced that they are rolling out their Shopping on Instagram feature to Instagram Business users across the globe. For anyone who is selling on Instagram, this is big news, and could potentially mean a sizeable increase in eCommerce sales. But what is Shopping on Instagram, and how will it help to sell your online store’s products? By the end of reading this guide, you will know how to set up and use the Shopping on Instagram feature to help increase your eCommerce sales. Shopping on Instagram has been around for the last year or so, but only available to select US-based companies. In March, Instagram announced they were launching Shopping on Instagram for eCommerce businesses of all sizes and in numerous countries. So far Shopping on Instagram is now available in over 45 countries, including the UK, Canada, Australia, France, Germany, Brazil, and many more. This is an extremely exciting development for businesses and brands that promote their products on Instagram. Shopping on Instagram is a new feature that will allow you to add shoppable tags to your Instagram posts. (See the example in the image above). 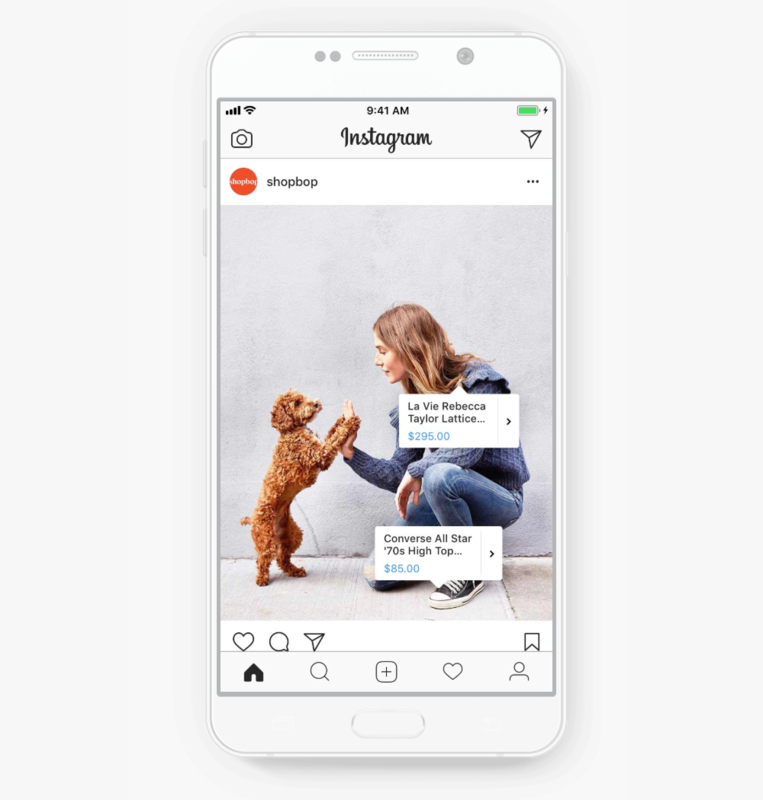 When someone views an Instagram post that contains shoppable tags, they will initially see a shopping bag in the corner of the image. Once they hover over the image, shoppable tags will appear, sharing the name and price of a product. However, there is much more to selling on Instagram than just the shoppable tags. If an Instagrammer likes what they see, they can click on a shoppable tag. They will then be shown extra information about the product as well as a Visit on Website button. If clicked, the button will take users directly to the product’s page or checkout page on the businesses eCommerce website. This enables products to be quickly and easily purchased by Instagrammers. Up until recently, the only organic way to add a link to your Instagram account was via your Instagram bio. And if you wanted to add a link to an eCommerce store directly from a post, then you had to pay to promote the post. Shopping on Instagram has totally changed this. By allowing eCommerce stores to add links directly from posts to product pages, people can easily find their way from your Instagram posts to your online store. This will help increase traffic, and ultimately improve sales. Shopping on Instagram will also allow you to display extra information about each tagged product. This extra info will help turn your Instagram account into an immersive visual storefront and encourage people to click through to your eCommerce shop. Therefore, people can easily jump between inspirational images, and actual purchases, creating happy shoppers and even happier sellers. Does Shopping on Instagram work? Children’s clothing company, Spearmint Love, has seen a 25% increase in traffic from Instagram since implementing the Shopping on Instagram feature. They have also seen an 8% increase in revenue that they attribute to shoppable posts. Lulus, a ladies clothing company, has been using shoppable posts since the testing stages of Shopping on Instagram. Since its launch, Instagram can be directly attributed to over 12,000 orders, and over 100,000 sessions. Hair company Tyme has also been selling on Instagram since shoppable posts launched in the USA last year. Tyme have found that since using the Shopping on Instagram feature, traffic from Instagram has increased by 44%. There are a couple of stages to setting up Shopping on Instagram. However, once you have been approved to use this feature, the creation of shoppable posts is very easy. Importantly, to be eligible to use the Shopping on Instagram feature, you will need to first create a Facebook business page. For more information on how to do this, check out our article How to Create a Facebook Business Page. There are a number of ways to upgrade your Instagram account to Business and connect it to your Facebook page. For this article, we will look at how to do so via Facebook. To get started, log into your Facebook account and open your Facebook business page. Select Settings > Instagram. Then click Log In, to connect to Instagram and sync the two accounts. You will now need to follow the instructions, adding contact info, to finish the process and upgrade your Instagram account to Business. 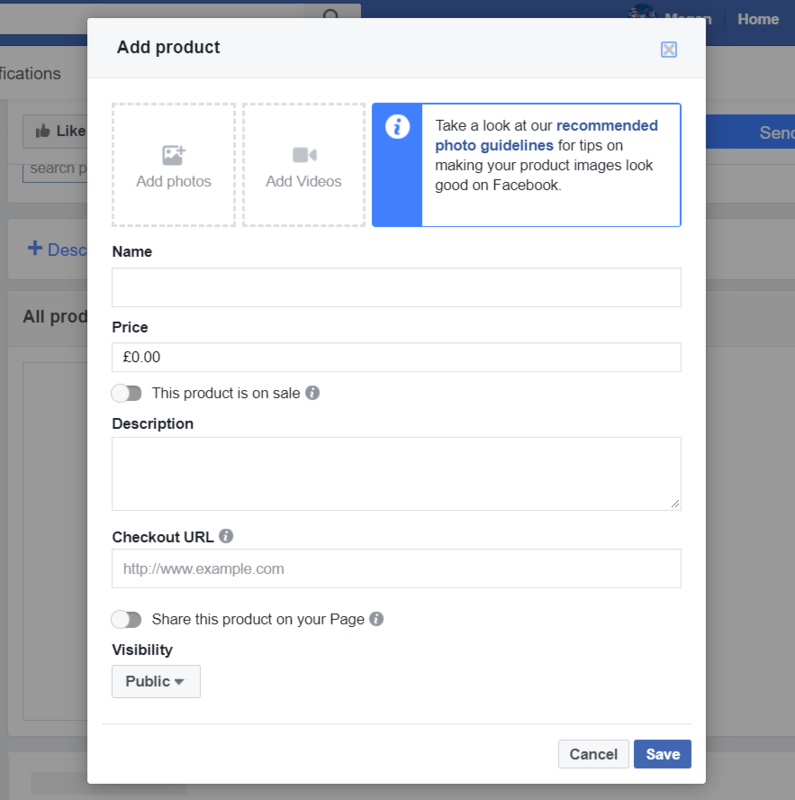 Next, you will need to create a catalog of your products on Facebook. Any products that you wish to promote on Instagram with shoppable tags will need to be added to the catalog. There are a number of ways to create a catalog with Facebook, including using Facebook Business Manager and Facebook Catalog Manager. However, for this post, we will look at how to create a catalog via your Facebook business page. To create a Facebook catalog, make sure you are using the Facebook Shop template on your Facebook business page. To check or change your page template, open your Facebook page and select Settings > Edit Page. Under Templates, click Edit to browse templates and find the Shopping option. Back on your Facebook page, select Shop from the drop-down menu on the left-hand side of the page. Then click on Add Product. You can now add the first product to your Facebook catalog. Upload images, add a product name and price and write a description. This is the information that will be displayed on Instagram when viewers click on the shoppable tags to learn more about a product. Therefore, take your time writing a good description, and use images that showcase the product at its best. Once you have finished, select Save and then repeat the process until you have added all of your products to your Facebook page. You will now need to wait for Facebook to authorize your account for Shopping on Instagram, which can take up to a couple of days. Once you have been approved for Shopping on Instagram, you can start creating shoppable posts. To do so, open your Instagram app and select Get Started > Business Settings > Shopping. You will now need to select the Facebook catalog you have created and then click Done. To add shoppable tags to a post, either create a new post or select an existing one. Then simply click on the image where you would like to add a tag, and enter the name of the product until it appears in the search box, just as you would tag a person into a post. Once you have finished tagging, select Done. Then Preview the post, and if you are happy with it, click Share. As you can see, once you have set up your Facebook catalog, creating shoppable posts is relatively straightforward. Try using shoppable tags on both single image and carousel posts to ensure a varied Instagram content strategy. Make the most of the Shopping on Instagram feature by tagging up to five products per post and up to 20 in carousel posts. Shoppable tags can be drag and dropped around an image to ensure they don’t block too much of the photo and that the post still looks visually appealing. Check that each tag displayed on an image touches the right product so viewers can easily see which product each tag refers to. Once you have added shoppable tags and published the post, click through to check that the URL for each product takes Instagrammers to the correct page on your eCommerce store. After you have launched shoppable posts it is also important to track their performance. Instagram Insights allows you to track the engagement and click through data of shoppable posts, and there are also a variety of Instagram analytics tools available. This will enable you to monitor how successful your posts are at driving traffic to your site, as well as help you to understand which posts your audience best respond too. You can then use this data to help you inform your future Instagram strategy for shoppable posts. Selling on Instagram using shoppable posts is now a reality for eCommerce stores across the world. And with Instagram currently testing shoppable stickers for Instagram Stories, the opportunities for driving traffic to your website and increasing product sales are growing daily. So are you ready to start selling on Instagram? Any questions about selling on Instagram with shoppable posts? Feel free to ask in the comments below! The post Selling on Instagram: How to Create Shoppable Posts on Instagram appeared first on Revive Social.